Central City Development Group (CCDG) had the privilege of planning development plans for the Figueroa Central site, better known as the “Piece of Jewel” land by the downtown LA real estate development community. 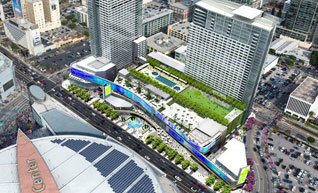 It is no secret that real estate is all about, “location, location, location,” and the Moinian Group selected CCDG for our expertise in land use development, city planning laws and policies, and successful track record to ensure that this unmatched location is properly developed into an equally impressive LA Live expansion. Recently sold to the Chinese tycoon Oceanwide Real Estate Group for $200,000,000, this four acre vacant land was, and still is, entitled for a one-billion-dollar mega real estate development project for the The Moinian Group, one of the country’s largest privately held real estate firms based in New York, which owns and manages $10 billion in assets. Hand-picked by The Moinian Group for our exceptional local knowledge of the downtown LA real estate arena, Central City Development Group (CCDG) was instrumental in implementing the new vision of its client in creating a new direction for the project. The Figueroa Central project plans to bring more than 200 hotel rooms, close to 900 condominiums and a variety of retail stores and restaurants to the corner of Figueroa and 11th Street. While there have been some roadblocks for the project since initial plans were released, CCDG was brought on board to streamline the development process with their expertise in the field. The developer is responsible for planning and bringing this project to completion, and the plans are quite progressive. The Fig Central area will transform into a safe place for pedestrians without neglecting the need for parking areas. The plans exhibit a large plaza with modern landscape features that create a relaxing, fun place for visitors, residents and area employees to pass time and enjoy the sunshine. Large cities around the world are striving to make their streets friendlier to bicyclists and pedestrians, and the Los Angeles Figueroa Central project will serve as an example of how that idea can come into fruition. 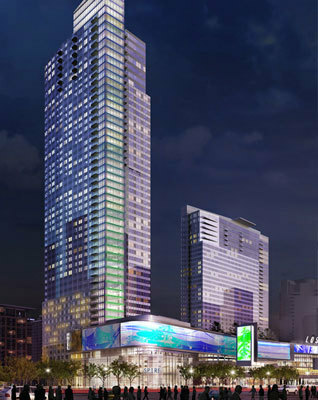 With a planned tower rising more than 300 feet in the air and a second high-rise building to stretch 450 feet into the skyline, the project includes more than enough space to accommodate retailers large and small. While hopes were high that the Moinian Group would easily secure the funding needed to begin construction on the Figueroa Center Project, unforeseen occurrences took place. As the economy continues to rebound from years of chaotic struggle, and with Oceanwide as the new developer of the project, it is expected that the project will easily receive funding and enter the construction phase in the near future. It is expected that the new developer will construct the project in two phases. 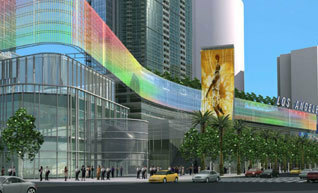 This means a portion of the project will open to the public while the rest of the project is in the construction phase. There is no definite date of completion, but with Central City Development Group help, you can expect a breathtaking finished product that is eco-friendly, industry leading, and economically stimulating.